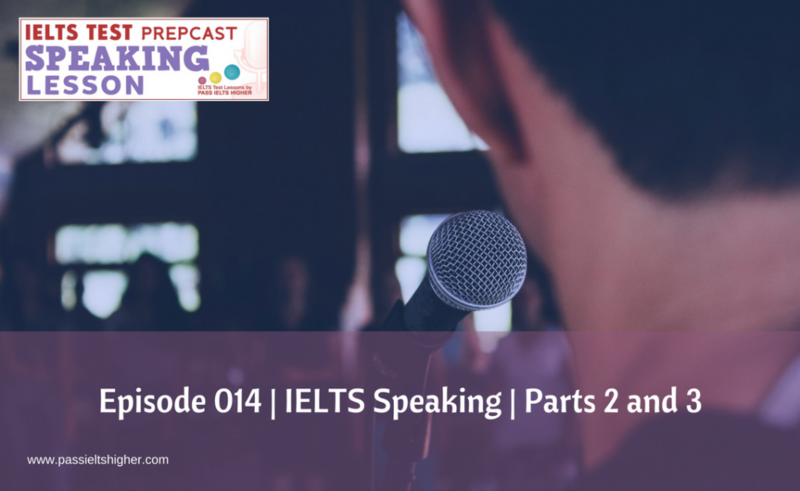 In this episode, Andrea asks Steve to answer a previously unseen Part 2 and 3 IELTS Speaking Test – they discuss Steve’s performance and then analyse how Steve felt about doing it and which parts he found most difficult. If you would like to take a mock IELTS Speaking test with us then click here. A longer lesson that normal for an IELTS Test Prepcast but hopefully students will appreciate the good information and advice provided. I’m Steve Price. I’m the founder of the Pass IELTS Higher website, which was started in late 2010 and has been successfully helping students achieve higher band scores since. Andrea Price currently lives and works in London, teaching IELTS. She has been teaching the subject at home and abroad for over twenty years. And now for today’s IELTS lesson. Steve:Hello. 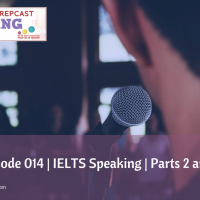 Today we’re going to talk about IELTS speaking, and we thought it might be an idea for Andrea to ask me to do a speaking part 2, which is what were going to do. We’re going to go through the whole lot, and then we’re going to break down into sections how I prepared for it, and then we’ll explain what was good and what was bad for each. Okay. Andrea: Hello. So we’re looking at speaking part 2 today. If you remember from the other podcasts, this section takes between three to four minutes, and what will happen is that I will tell you, as a teacher, you’ve got two minutes to tell me about the topic I’m going to give to you, but before you start speaking, I’ll give you one minute to think about what you’re going to say. So we start that now. Steve: Okay. But before we start it, just to let the listener know that I haven’t seen the topic. I haven’t seen the questions. So we’re doing this live, aren’t we? Andrea:Yes. Then hopefully, that’ll be a good experience for you to report back to the students listening. Andrea: Okay. Here is your topic, and you’ve now got one minute to plan it. Okay. You’ve now got two minutes to tell me about your topic. Andrea: Fifteen minutes are up. So do you have to make lots of decisions like that? Steve: I have to keep on re-evaluating whether what I am doing is still worth doing, and I do that periodically. It depends on how much money I have coming in, because of course now I’m effectively self-employed, so I need to have a level of income. In my previous job prior to 2006, I did get paid very, very well, so the slight dilemma I had was that I wanted to do something which normally would be paying, being paid a lower amount of money for. So I had to earn money in some way, so I had to come up with a scheme whereby I could earn the sort of level of income that I had previously, but I also was wanting to grow this sort of business as well. Andrea:Okay. Thank you. So you’ve been talking about a decision you’ve made, and I’d like to ask you one or two more general questions related to this. Andrea:Who would you think makes the decisions generally in a family unit in your country? Steve:I think even though it’s a modern country in the twenty-first century, I would still suggest that men, the man of the family would generally make the major decision. However, what I would add is that I believe that more of them, perhaps in the 1940s, ’50s and ’60s, you’re seeing any major decisions being discussed more and the views of others being taken into account. Andrea:Okay, and do you think it’s a good thing that this is changing? Steve: I do actually, yes. Prior to that, the man was the absolute ruler of the—from a social status point of view—the man would’ve been the absolute ruler of the family. And what I think is good that the women are being recognized for their skills, competences, and knowledge and their ability to contribute to decisions such as that, and their views are being taken into account. Andrea:If young adults who are teenagers have problems, who do they go to for help in your culture? Steve: In our culture, I believe that unless they happen to have a particularly good relationship with the parents, then they would not. They would either go to a nearby close relative, or more likely they would go to other friends. And it may be that they have one or two role models. If they are school age, perhaps they might go to a favourite teacher. The way that our education system is structured currently, then they, the schools actually have people that you can go to, people who are able to provide advice and mentoring and guidance. Andrea: Okay. Do you think this is the same in all cultures? Steve:No, I don’t believe it is. I’ve been lucky enough in my job to, in my previous job, to have worked in many places, including in Asia and in North America, both the US and in Canada, and I believe, although in the westernized countries it is pretty similar—in fact I would argue that in America, in particular the United States, that they’re a little bit more advanced than we are in terms of women’s rights and the way the they mentor their young people—I think in other cultures where there’s a tradition of male dominance and the ability to stand on your own two feet, then I think it’s less the case. I think it’s all contained within the family, and again what the leader of the family says goes. Andrea: Do you think it’s better to ask a friend for help when you have a decision to make or a member of the family? Steve:If I can answer this in two ways, I think, as a parent, I would prefer that they ask the parent or a member of the family because I would then at least have some feeling as to what the advice they would be given would be, depending on who they went to of course. But generally speaking, they would have the best interest of the child at heart, and it would broadly align with my own, with my own view. But speaking as, or looking at it from the point of view of a teenager or a young adult, I can fully understand why they would want to go to their own peers, your friends, or people of their own age, people looking for advice. Andrea:How do you think we can encourage children to ask their parents rather than their friends? Steve: I think that has to start from the way that children are brought up. They would have to be encouraged from a very early age in their lives to be able to talk to their parents about anything, anything and everything, so across a broad spectrum, whether it’s personal problems, whether its boyfriend-girlfriend issues, whether it’s maybe wanting to come out as being homosexual or something like that, whatever it is, I think, and however difficult the conversation must be, they would have to have established a history of discussing difficult topics with their parents. Andrea: Do you think the decisions you have to make change as you get older? Steve:Yes, I believe they do, and they—certainly in my case—they change with increasing responsibility for others. Or the time you’re only responsible for your own well-being and outlook, then it’s a lot easier to make a decision because you’re the only person that it’s really going to affect. As soon as you have to start taking the lives and livelihoods of others into account, whether it’s people at work, whether it’s members of the family, then you have to think a little bit more widely than perhaps just yourself, and you have to take into account the fact that you are impacting other people’s lives. Andrea: Thank you very much. That’s the end of the speaking test. Steve:Okay. So how would you summarize how I did? Steve: Okay, that’s interesting because I would have said that, as I was answering where I was having to think on the fly, where I was having to think of my answer because I wasn’t expecting the question, and I would have said that there was a hesitancy there, perhaps not a hesitancy in speaking and formulating the sentence, more a hesitancy in formulating the idea that I was then going to project in the sentence I was going to project. Andrea: Yes, that’s fine, though. It’s okay for you to think about ideas, but you’re just not supposed to hesitate when you’re speaking to me, and I didn’t hear any hesitation, so I think that was really good. Steve: Okay. Now just a bit of feedback from myself actually was that this is the first time I’ve ever done this. I haven’t taken the IELTS test myself, so, and although I am reasonably competent at English, I am aware, because my background is engineering, that it’s not something I specialize in in English. So I know I have a reasonably high competence, but I know, I equally know it’s not as good as somebody who’d been studying language and, or literature for their adult life. So what was interesting for me was quite how difficult it was to then, having been given the cue card to answer for the speaking part 2, quite how difficult it was to then work out what I was going to say. If I was to suggest to the students listening, it doesn’t matter what you’re going to talk about. You just need to make a decision and talk about it, so, and if—actually, that’s what I did, because there was obviously a number of things I could have chosen to talk about in terms of decisions I have made in my life, but I decided that the, if I was going to make use of the two minutes or so that I have to prepare to their maximum, what I would have to do is to make the decision about what I was going to talk about and then pull out some elements which I could then talk to and answer questions on as we went through. But I must admit, I did find that very different. Andrea: I agree that you were good to focus on one thing, because if you were without your native language without the native language of English, then you might panic too much. If you don’t quickly decide what you’re going to talk about, you might panic and then lose your preparation time. So that was, that is also good advice to the listening students. Steve: Yes, the other thing that I will suggest is whereas you probably could pre-prepare a number of phrases and a number of things you could wind into this sort of topic and this sort of discussion, my feeling is that largely that that may not help you because you don’t, you really don’t know what questions are going to come up. So actually, the most important thing that you could is to have a broad level of vocabulary, and of course, in my case, I’ve got it because I’m native. But also to—it boils back down to make the decision early about what you’re going to talk about, and it doesn’t matter, because the sense I get is you don’t care about the topic really. What you’re caring about is how I’m discussing it. Andrea:Yes. No, that’s exactly right. Steve:So make the decision early and then make my point early, and then we can talk around the point. So if we were to treat the points as being hooks, I’m actually formulating the hooks for you to talk about our part of that two minutes. Andrea: Yes, that’s exactly right. You’re making, you said about making points and you said covering the main points as quickly as possible, which is also good advice. It means that you’ve summarized long before the two minutes or at least you’ve summarized between the within the two minutes. Remember, if you don’t have your final sentence in before the two minutes is up, then you’ll lose points, so that means that you have to have covered everything, and then as you said you can talk around the points. Also you were saying about hooks, I think that could be equated to having topic sentences, so you got like a—in the writing, they talk about a thesis statement, so that was your general idea, which you, as you said decided very quickly to talk about. Then each of your points were like a topic sentence or what you called a hook, so yes, that’s very good advice. Steve:Yes, the other bit that I was extremely aware of as I was formulating my answers or planning it was not to talk about too much, because of course, your brain has identified something you want to talk about, and of course you want to get all that information down, and there’s way too much there to either write down or talk about. So you really do need just to give yourself a couple of points to talk about, and keep them simple, because when you’re having the discussion, then the complexity of your ability in English is going to come out. Andrea:Yes. No, that’s exactly right. If you talk too much as well, you might make lots of mistakes, and good advice is, as you say, keep everything short, so it’s about forty seconds each point to make your two minutes, really. That’s something the student can bear in mind. Tell me about your planning. Did you feel under pressure when you were planning or . . .
Steve:I did feel under pressure, yes. What I, if I was to write maybe—in fact, maybe what we can do on this one is I will scan what I’ve got in front of me. The way that we prepared for this—as you know, but the listeners don’t—is you gave me the cue card, which is a box which has got the questions in that you, what you wanted me to address. So within that cue card, it says, for example, “Tell me about a decision you have made. What was the decision? Why did you make the decision? When did you make the decision? And has that decision affected your life in a good or bad way?” Now what I did—and I will scan this and include it as part of the show notes—the first thing I wrote down was actually the main point, which was “to set up own business”. So that’s not even correct English in the sense of the question, in respect to the question being asked, but it was a topic I wanted to talk about. Then underneath that, I just put in a couple of points I wanted to—I can’t even read my own writing—I wanted to contribute something, and what I meant by that, well, I wanted to contribute something to wider life, to the world, yes. I wanted to do something which made a difference. In fact, I never picked up on that point as I was going through it, but, and also, as people will see, I also captured here that I actually made that decision back in 2006, so here we are, eight years further on. And so where am I now? The other bit I’ve made notes about is, “Has a decision affected your life in a good or bad way?” And I’ve said “Good way overall”, “It’s been exciting”, “wrong avenues”, and “pivoting”, and those are the notes I made myself. And of course the wrong avenues are I started down the path, decided it wasn’t going to work, made the decision to change and move on, and hoped to do something else. And in fact that second avenue didn’t work, but we just didn’t have time really to explore that very fully. Andrea: And also then how you used them. Steve:And then how I used them. Steve:Now the thing to note here is, at least from my looking back on it right now, the thing I noted about it is—I’m now struggling to read my own writing which is interesting, because I was writing very quickly—but also I didn’t pull out some of the ideas I thought about. But clearly, I was able to speak for two minutes, so my brain was obviously thinking it through. So that didn’t prevent me from having the discussion with you for two minutes, but what it did mean is that I was going off plan a bit. So I could appreciate that if you didn’t quite have the extensive vocabulary as I have, being a native speaker, that you would actually find that very difficult, because you’re, not only are you not pulling out the points you want to make, you then are having to create new vocabulary that your brain may not have thought about. Andrea: Yes, that could get you into trouble. You’re right. You have to think it through, really. And I would say the same in section 3. If you answer a question—I’m listening to you, and I’m going to pick you up on any point, so again be quite careful about what you say, in case it causes problems with your answering a bit later on. Yes. Steve:Okay. So that’s been an interesting experience for me. In particular, it shows me how little or much I know about myself and how I can summarize that down into something nice and succinct, which is—because I was conscious of the need to link and the need to use slightly more complex grammar. But what I don’t know is, because I was obviously intuitive and came straight out naturally. I wasn’t going to think of it, and again, I really feel for the foreign candidates who don’t have English as a first language, who are then having to think of complex grammar, because they have to demonstrate that they are capable of using it, whereas there will be a—I think if you’re having to work at the more complex grammar, there’ll be a natural tendency to keep it simple, whereas, of course, I didn’t keep it simple purely because that’s how I speak. Andrea:And you can do it. Andrea:How did you feel talking to me? Did you notice or did you think about me while I was looking at you? Did you? Steve:Initially, there was apprehension. I knew you were going to be assessing me. You were asking me questions. But to be honest the two minutes is not that long. So as long as you can get yourself into a mindset of having a conversation and all you are doing is you’re telling somebody about yourself or an aspect of yourself, then once you get going, it’s fine. Steve: The other pressure I was aware of was time pressure. In the room that we sat in, we don’t have the visibility of a clock. I imagined that that would become, in the exam situation, where you do have sight of a clock, it could become an even bigger pressure. Andrea: Yes. In fact, it just, that depends really on the student. The examiner has the timing, and it’s really under the examiner’s control. The students don’t really have their own clock, so probably, that would lessen the stress I think. And also something students often say is that the examiners, they worry that their English is really bad because the examiner doesn’t show any emotion, and so I’m just reminding you that yes, when you go into the exam, maybe the examiner’s not going to tell you. You won’t be able to see from the examiner’s face whether you’re doing well or not doing well. Andrea: So that’s something not to worry about, really. Steve:Also, a question that threw me actually, and even though when people see the scanned version of this, you’ll see that the questions that you asked are actually on there now, I hadn’t actually read them, because I only literally picked up the paper just before we started. Andrea: That’s a good point. You don’t see them. Steve:Okay. And I didn’t imagine that I would. Steve:Yes, it is. And because I hadn’t read them, of course, it came across as a conversation. And in my head, but as a native speaker, I was not expecting the questions related to my country or to my culture. Now of course, if you’re learning English as a person who doesn’t have English as his first language, then maybe that’s more at the forefront of your mind. So whereas I was giving a very Western-centric response, of course, people from the likes of Saudi Arabia and, or maybe China, maybe Indonesia, places like that, where they have a distinctly different culture, that would probably be more at the front of their mind. Andrea:Yes. No, you’re correct. It does seem to be a strange question for a native speaker, but obviously, we’ve all got cultures and you’re exactly right. A person from another country or another religion would answer in a different way. Steve:Yes. Okay. Is there anything else that we think we needed to cover on this one? Andrea: I don’t think so. Steve: I think it’s been a useful exercise. I think the, I hope the IELTS candidates listening to this would also find it useful. What I would encourage the listeners to do is to write any comments back on this particular blog. We don’t very often ask for comments, but we are always very, very, pleased to have them, and we will respond to them if we get them. But in this particular instance, I think that it would be very, very helpful if people were to, would be to go to the website, ieltstestprepcast.com. Just go to the post that’s got this prepcast in it, and leave any comments that they have, and we will consider those. And in the fairly frequent roundup tips type of sessions we have, we’ll address some of those. Andrea:Yes, that’s a good idea. And also you were saying about writing points down. Anyway, for their own benefit, they should go away and practise things like this. Do they know how long it takes to speak for two minutes? Actually, when you don’t have a lot of language at your disposal, or if you haven’t practised, two minutes is quite a long time. Andrea: Yes, good to go away and practise. Steve: Okay. Well, we obviously covered a lot today, probably more than normal. This is a slightly longer session than we would normally have, but I hope the listeners have found it useful. But I think we’ve covered everything we wanted to cover today, so until next time. Thank you very much. I am neither a native speaker nor a test assessor. But, after listening to you, you did a very fantastic job. Thank you and good to see you on the site.